We’d love your help. Let us know what’s wrong with this preview of The King's Last Song by Geoff Ryman. To ask other readers questions about The King's Last Song, please sign up. I've only ever written (e-mailed) three fan letters, and they've all been to fantasy writers. My husband says he always wants to meet people he admires, because he has this fantasy that he'll be able to come up with something witty and brilliant to say that will impress them and make him memorable. The only time I've ever handed an author I loved a book to be autographed, I just stood there beaming like a slightly backward three-year-old after one too many trips to the sundae bar until she clear I've only ever written (e-mailed) three fan letters, and they've all been to fantasy writers. My husband says he always wants to meet people he admires, because he has this fantasy that he'll be able to come up with something witty and brilliant to say that will impress them and make him memorable. The only time I've ever handed an author I loved a book to be autographed, I just stood there beaming like a slightly backward three-year-old after one too many trips to the sundae bar until she cleared her throat politely and said "um... what's your name?" Anyway, one of my fan letters was to Geoff Ryman for his book The Child Garden, which was amazing -- one of the few books that makes you feel like you've truly never read anything like this before. He wrote back and was very gracious (all three of them were). Unfortunately (for me) I didn't love his next few books as much. Still, one of the things I admired about him was how he could differ in style and approach so much from book to book -- he's the furthest thing you can find from a formulaic writer. The Child Garden was fantasy -- subversive and thought-provoking fantasy, dealing with themes of social engineering, thought control and repression, among others. The King's Last Song moves between fiction and historical fiction. The modern narrative deals with the archeaological discovery of an ancient book written on gold leaves at Angkor Wat. Luc Andrade, a professor who grew up in Cambodia, is kidnapped along with the book. William, Andrade's motoboy, guide and friend, and Map, an ex-Khmer Rouge member, are two of the men involved in the attempt to rescue Andrade and the book. The other narrative is the story of Jayavarman VII, the Buddhist King who ruled Cambodia in the twelth century. Usually when a book alternates narratives, especially one in the present with one in the distant past, I find myself rushing through one of them in order to get back to the other. I didn't feel that way in the least with this book -- both stories are equally riveting, and wrenching. Perhaps Ryman's greatest strength is his characterization. His characters are so fully realized, so nuanced and multi-dimensional, that you can almost see them right in front of you. There are no types here -- good people commit unthinkable atrocities, and evil men are capable of amazing feats of generosity. Ryman also evokes Cambodia vividly, its heat and beauty and poverty and desperation. I've heard that connecting something you're learning with a strong emotion makes it much more likely that you'll retain it. I feel as if the events and characters in this book are burned into my mind permanently. Luc Andrade, the French professor who grew up in Cambodia -- he's taken prisoner, held hostage and in fear for his life, and he still cares more about the people of Cambodia and protecting the book than he does about himself. William, the touchingly earnest motoboy who keeps files on everyone he meets in order to learn from them, who "buys fruit and offers you some, relying on your goodness to pay him back. When you do, he looks not only pleased, but justified." Map, who confronts every situation with a frightening zeal and hilarity, who acts with the single-minded fearlessness of someone who has nothing at all left to lose. Jayavarman, the prince who becomes a slave and then a King, a rare King who thinks about the lives and needs of all of his people. Jayarajadevi, his first wife, wise and enlightened but tormented by the need to accept the second wife he brings home from his period of enslavement. Rajapati, the king's son, born with twisted legs and struggling to temper his bitterness by finding a way to be useful. Nothing happens the way you expect it to in this book, which I guess is also one of the themes. At one point it says that 1985 was the worst year of Map's life, and then a number of good things happen, which naturally you read with a sick feeling of foreboding because clearly something horrifying is coming. The Khmers Rouges committed unthinkable atrocities, and yet many of them were just poor, uneducated young boys who joined the army out of desperation or ignorance. The book is full of searing moments of honesty and unlikely friendships that make small redemptions seem possible, in the midst of despair, which seems the very best one can hope for. For which one can hope? It is a passionate, eloquent, moving, disturbing story. I am now going to buy a copy (I got it from the library) and obnoxiously demand that everyone I know read it. 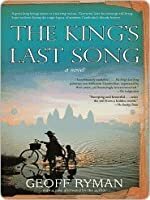 The King's Last Song tells two parallel stories, the first set predominantly in 2004 (with flashbacks to the 60s and 80s) around a great find at an archeological dig at Angkor Wat: a book of golden leaves, a hundred and fifty-five leaves of gold inscribed with the personal story and history of one of Cambodia's greatest kings: Jayavarman VII, a Buddhist who brought the Path to all levels of Cambodian society, built great temples and other structures, and treated the lowliest of categories (caste The King's Last Song tells two parallel stories, the first set predominantly in 2004 (with flashbacks to the 60s and 80s) around a great find at an archeological dig at Angkor Wat: a book of golden leaves, a hundred and fifty-five leaves of gold inscribed with the personal story and history of one of Cambodia's greatest kings: Jayavarman VII, a Buddhist who brought the Path to all levels of Cambodian society, built great temples and other structures, and treated the lowliest of categories (castes) as well as the noblest. The leader of the UN dig team, a Frenchman who grew up in Cambodia, Professor Luc Andrade, goes with the army - led by General Yimsut Vutthy - to airlift the precious find to Siem Reap, there to be restored, translated and displayed. The move is kept secret because chances are high that the treasure will be stolen and sold off in pieces, but on the way to the airstrip the worst happens: a gunfight breaks out, Luc and the General are taken captive along with the book, and whisked off to a small, smelly boat where they're kept locked up in the hull. The Professor made friends among the Cambodian locals, and while the army, the Patrimony Police and APSARA, the organisation that protects Cambodian artefacts and monuments, handling tourist agencies and art thieves, all launch into investigation mode, two of Luc's friends and helpers - William, a smart and charismatic motoboy who works for the UN dig team, and Loak Tan Map, an ex-Khmer Rouge killer who now works for the Patrimony Police, start their own investigation to find their friend. The other story is interwoven between the present-day story and tells a fictionalised history of Jayavarman in 12th-century Cambodia - the author's notes at the end explain which parts are based on known fact and which he took liberty with to create the story. While I did find Jayavarman's story interesting, I felt much more detached from it and found it hard to follow at times - the people and place names are tricky and I could have used a map of 12th century Cambodia (and modern-day Cambodia too) to understand the movement of armies and invaders and alliances. The modern-day story I found more compelling, more tragic and more ... humanising. Despite the lack of maps which really help me orient myself and the characters within the story, there is a fantastic sense of place here. Sure Cambodia is completely foreign to anything I've lived in, including Japan, but it's more than that - it's the fine details and the care Ryman takes to share the beauty of the land and the poverty, the resilience, the innovativeness of the people. The modern-day story goes into the heart and hearth of people and their homes, their histories and their cares and their culture. I really don't know much about Cambodia, and my understanding hasn't really improved for having read this, despite all the detail and no doubt honest depiction of the people - I can only ever really see them through my white colonial eyes as long as the only voice I'm hearing is a white colonial one, but that doesn't mean I can't be sympathetic. The parts of the modern-day story that really resonated with me were those that grasped the larger context, the tragic modern history, and showed a people yearning to be whole again. Where the novel disappointed me was in the writing. Ryman was often able to render a scene or a character's feelings or thoughts into a kind of abstract visual art, yet more often than not the prose was needlessly vague, unconnected and confusing. It was not a cohesive narrative by any means, and it gave me the impression of an author who's not in complete control of his craft. The words were mastering Ryman, instead of the other way around. This impression isn't helped by the poorly copy-edited text, rife with typos, missing adverbs, and a weird mishmash of Canadian and British English spelling that did my head in. Even if I only get some of those references, the meaning is still clear, and makes me remember just how little I know about the region's history. In fact, it's not all that popular a topic of study, is it. I didn't know Cambodia was caught up in the Vietnam war, for instance - which is what I deduce from the above. Australia went to war for America in Vietnam, but it doesn't get taught much in schools. It's sad: we're more likely to study (because it's offered) the Tudors and the French Revolution than arguably more important conflicts, on both political, ideological and geographical fronts, that occurred not so long ago and not so far away either. I haven't said much about the characters, and that's mostly because the main character is Cambodia itself, but William the motoboy and Map definitely carry their parts of the story well. Luc is interesting but more of a plot device, fleshed out but only in service to the plot. There are other characters, some more subtly portrayed than most, but there are so many you get a sea of Cambodian faces in your head, and they start to blur together. The 12th century story was less dynamic, and the characters were both more simplistic and harder to follow, especially when dealing with the Chams (who I think are now called Vietnamese?) and all the numerous princes. Though I did like the creation of a character who didn't really exist, the king's deformed son by his consort, who gave a more human and bitter perspective of Jayavarman. Even heroes have flaws and make bad decisions. Geoff Ryman is a fantastic writer and this book is no exception. I am loving it. Good book. Annoyed by Jayavarman's several wives -- I know, I know, historical fact and all that, but the imbalance of this sort of thing always annoys me. Liked Map. I didn't think I'd love this book as much as I did, but it was moving, engaging, entertaining, and historical. I laughed aloud and even cried. A great read. I read it while traveling in Myanmar and Loas, and while this story takes place in Cambodia, I was able to visualize the setting perfectly bases on my surroundings. The perfect book at the perfect time! It's been a long while since I've read a book that has become a favorite. I am saddened not to have heard of this book until now, and I am grateful and happy that the country which this book is about carried this title. Sometimes, you find books at the right place and at the right time. The book, a historical fiction, jumps from the 12th century, during the time of Jayavarman, to the reign of Khmer Rouge, and to the present, when an archaeologist supposedly finds wrapped gold leaves with inscript It's been a long while since I've read a book that has become a favorite. I am saddened not to have heard of this book until now, and I am grateful and happy that the country which this book is about carried this title. Sometimes, you find books at the right place and at the right time. The book, a historical fiction, jumps from the 12th century, during the time of Jayavarman, to the reign of Khmer Rouge, and to the present, when an archaeologist supposedly finds wrapped gold leaves with inscriptions, written by and about the life of Jayavarman. We then see the rise and fall of kingdoms, of people, and a complicated history of a nation that has been put under one king to another, one dictator to another leader. ISpotted this in the airport at Siem Reap and thought it would be a perfect end to my vacation in Cambodia. I wanted to like this more than I did. I preferred the modern story - found the historical story so boring that every time I reached the end of a modern chapter I would stop reading because I dreaded the historical part. Very disappointing. Well written book dealing with the aftermath of Cambodia's crazy long civil wars and the people from the various sides of it ending up having to get along and work together. Un intreccio di tre storie, ambientate una nel 2004, una durante il perido dei Khmer Rossi e quella di Jayavarman VII, il re a cui si devono molti degli edifici di Angkor e la diffusione del buddhismo. In this novel, Geoff Ryman moves between the 12th century life and times of Cambodia’s King Jayavarman VII (c 1120 – c1215) and the 20th century lives of Luc, Map and William. When archaeologists discover an ancient book written on gold leaves at Angkor Wat, everyone wants to be involved. The precious artefact is stolen and its guardian, Professor Luc Andrade is kidnapped with it. The search for Luc and the precious book brings I loved this novel. The precious artefact is stolen and its guardian, Professor Luc Andrade is kidnapped with it. The search for Luc and the precious book brings together a number of people, including the young motoboy William, and the ex-Khmer Rouge cadre Map both of whom are also victims of Cambodia’s recent history. The book itself contains the wisdom of King Jayavarman VII, the Buddhist ruler who, through uniting a war-torn Cambodia in the 12th century, was able to create a kingdom that was a relative haven of prosperity and learning. This is one of the best novels I have read this year. The mystery surrounding the book, the contrasts and similarities of Cambodia across the centuries and the urgency of the mission to find Luc are brought together very well. The sense of history, the desolation of war and the dislocation of lives is also handled well, and many of the characters are finely drawn. For me, the love and respect of Professor Luc Andrade and King Jayavarman VII for Cambodia is the central theme that unites the two major threads of the novel. Each of them, by looking to a brighter future, can see a hope for Cambodia that cannot have been apparent to most living through the turmoil in either century. This novel will stay with me a long time, and has awakened a desire to learn more about Cambodia both past and present. This is a double book, both taking place in Cambodia. The main one deals with Jayavarman, king on the XIIth century. The supporting one (though it could be accepted it is the opposite way round, but that is my own view) presents Cambodia as it enters the XXIst century, after the horrors of the previous century. I find the present better handled than the past, as the style and language are not different enough from the present, and some concerns are also quite modern. The background is superb, as This is a double book, both taking place in Cambodia. The main one deals with Jayavarman, king on the XIIth century. The supporting one (though it could be accepted it is the opposite way round, but that is my own view) presents Cambodia as it enters the XXIst century, after the horrors of the previous century. The background is superb, as usual with Ryman. The character of Map robs the scenes where it appears, and weakens those where he is not. The tale is one of wonder, love for the country and over all, searching for redemption, for forgiveness. Something Cambodia needs too. Solid 3.5 stars for me. I bogged a bit about 3/4 through otherwise would have been a 4 or 4.5 star. Two stories, once set in the 1100's and one in the early 2000's in Cambodia. Many parallels although the two stories are quite different. I did like the linkages between the two stories and how history does (perhaps especially in the case of Cambodia) repeat itself. I liked how slowly characters were revealed and we got a much better understanding of them. Quite good and would recommend to my friend Solid 3.5 stars for me. I bogged a bit about 3/4 through otherwise would have been a 4 or 4.5 star. I really wanted to like this book! I picked it up from a kid on the street in Angkor Wat. It had everything in a book I want. The book is two stories. One: A adventure involving a stolen golden book. 2nd: The story of King Jayavarman VII, the Buddhist ruler who united Cambodia in the 12th century. an interesting dual timeline story. I do not know much history of Cambodia other than the headline-grabbing pieces. I did visit the Siep Reap/Angkor area in 2003 so I have that visual in my head. I enjoyed the stories, it would have helped me locate the action if the book had contained some geographical maps of the SE Asia of Jayavarman VII's time & the Cambodia of today. Some timelines might also have helped me stay focussed. I relied on my guidebooks for much factual information. This was a very good novel for a book and an author that I didn’t know what to expect from. In one half of the story you get a glimpse into the history of Cambodia around the time when Angkor Wat was built. The other half deals with the contemporary Cambodia and its recent brush with the genocidal Khmer Rouge. The writing is not the best, but the great plot and the background insight into Cambodia that it provides make up for it. I really enjoyed this story. Life was given to the mysterious character of Jayavarman VI, a man who is essentially still much a mystery. Lots of artistic license, but also much of the sense of what Cambodia is and the way Cambodians often think and behave is captured here. Part of my enjoyment no doubt comes from the considerable time I have spent there myself and the time and favour I feel happy to give to Cambodians. A great yarn. Recommended to Jillian by: H.N. The writing style of this book is very nonoriginal - after reading lots of nifty creative brilliant books it is kind of an intellectual downer. The plot is good though. It was especially cool to read this book after having visited Angkor Wat - I could picture a lot of the scenes that occurred in ancient and modern Cambodia with striking clarity. I'm not sure if it's really worth reading if one lacks an emotional tie to the region though. This was pretty amazing. Not at all the kind of thing I usually read but I loved his other books so I picked this one up despite the lack of sciencefictional elements. Half of it takes place in modern-day Cambodia, and half is about 800 years ago. I really didn't know much about Cambodia before, so it was cool to learn a bit about it. Also, his writing as usual is evocative and compassionate. I definitely recommend! Tells a fictionalized story of King Jayavarman VII of Cambodia, and about an archaeologist who discovers a gold book that tells Jayavarman's story, and is subsequently kidnapped with his find. His friends Map, an ex-Khmer Rouge, and William, a boy who grew up after the Pol Pot era, set out to find him. Really nicely done - manages to convey a great amount about Cambodian history by focusing on some compelling characters who have lived through different parts of it. This brilliantly written novel portrays two Cambodias, separated by 800 years, but in fact barely different. It is a sobering look at what unifies or breaks up a country, how and why people go to war, and what happens when greedy self-servers are in power. For South East Asia or Cambodia lovers, this is a must-read. For others, this is a discovery into South East Asia... its fragilities, its beauties. Two stories, one of Cambodia in current times as seen through the eyes of a motodop driver, and the other story that plays during the time of Angkor Wat and King Jayavarman, are connected when an ancient book is found, written on leaves of gold. 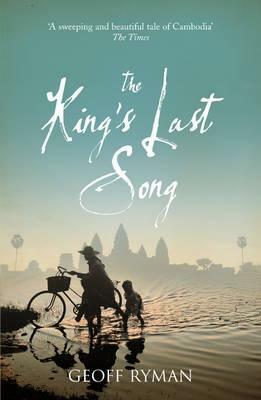 The King's Last Song gives an interesting view into the Khmer culture and lives of Cambodians now and in the past. I loved reading this. What a wonderful book! Such rich characters. One of the things I liked very much is after the story ends, the author writes about how he put it together, where he deviated from known history, why he made the choices he made, and even where his limitations were. This will move to the top of my list as a favorite. Anyone interested in Cambodia should give this a read. The novel is fictional, but it gives you a taste of both Cambodia's ancient history (the time period when Angkor Wat was built), the time period when the Khmer Rouge was in power, and the current state of the country. Ryman has obviously spent a lot of time in Cambodia and understands the culture and people. Geoffrey Charles Ryman (born 1951) is a writer of science fiction, fantasy and slipstream fiction. He was born in Canada, and has lived most of his life in England. His science fiction and fantasy works include The Warrior Who Carried Life (1985), the novella The Unconquered Country (1986) (winner of the British Science Fiction Award and the World Fantasy Award), and The Child Garden (1989) (winner Geoffrey Charles Ryman (born 1951) is a writer of science fiction, fantasy and slipstream fiction. He was born in Canada, and has lived most of his life in England. His science fiction and fantasy works include The Warrior Who Carried Life (1985), the novella The Unconquered Country (1986) (winner of the British Science Fiction Award and the World Fantasy Award), and The Child Garden (1989) (winner of the Arthur C. Clarke Award and the Campbell Award). Subsequent fiction works include Was (1992), Lust (2001), and Air (2005) (winner of the James Tiptree, Jr. Award, the British Science Fiction Award and the Arthur C. Clarke Award, and on the short list for the Nebula Award).